Car and Diner | Wisconsin in Fall, Proving Thomas Wolfe wrong: You can indeed go home again. When I was growing up my grandparents had a 100-acre farm, just outside of Reedsburg Wisconsin. My sister, cousins, and I spent our summers and weekends riding our bikes down the gravel roads, playing in the hayloft and in the sandpit down the road, catching lighting bugs at night, and eating fresh strawberries, tomatoes, and rhubarb—all from my grandmothers garden. Winters were spent riding snowmobiles and half freezing to death. Both my grandparents are gone now, and the farm sold long ago, but most of my relatives still live in the area. 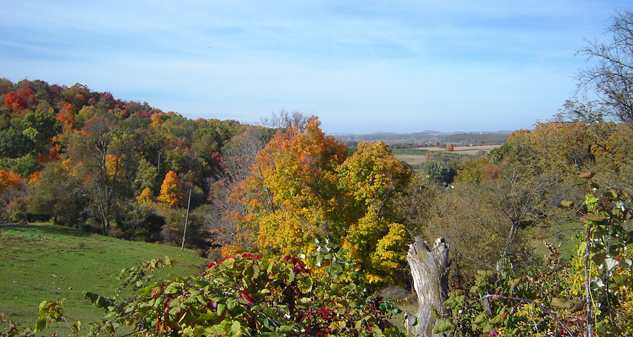 I had not been up to Wisconsin during fall to see the colors since I moved from the Midwest in 1980. So, last October I decided to take a road trip and drive my parents, Allan and Iva up for a family reunion. The adventure began pre-dawn on a Friday morning. I loaded up my 2001 Mercury Grand Marquis and pointed it north, to South Daytona where I picked up Allan and Iva. I know Car and Diner is about exotics and sports cars on the open road, but for driving long distances on the interstate in Lazy Boy comfort nothing beats a Grand Marquis. All it needs is a flat screen TV and it’s like you are in your own living room. And a bonus—it is almost invisible to state troopers. After a long but uneventful first day we pulled into a Drury Inn in Paducah Kentucky. We had made good time and got there for the Kickback dinner buffet, where we had pasta with Swedish meatballs, soup, salad, and baked potatoes. Not exactly Michelin Guide three-star but it came with the room and saved us from having to go out and find supper. We left at 3 AM the following morning so we could get to my Aunt Marcella’s and Uncle Dave’s home in Reedsburg early, to visit my dad’s brother Walter, who is in poor health. It was a nice visit, and Aunt Marcela treated us to a wonderful home cooked meal featuring my grandmother’s-recipe Spanish rice. The road trip has become a tradition for my dad and me. Before my grandparents moved to Reedsburg they farmed land near Twin Bluffs in Wisconsin. My dad spent most of his youth here and most of our family lived in this area. The next day we took Highway 33 out of Reedsburg to La Valle, hit Highway 58 which took us to Muston, and then followed Highway 12 to Camp Douglas, traveling through the rolling hills, and past the bluffs and the farm country of southeastern Wisconsin. Now would be a good time to explain why, in my opinion, this is one of the most beautiful parts of the country. Tens of thousands of years ago a swath of the Midwest was spared the effects of the glaciers as they moved south. It’s called the Driftless Area. 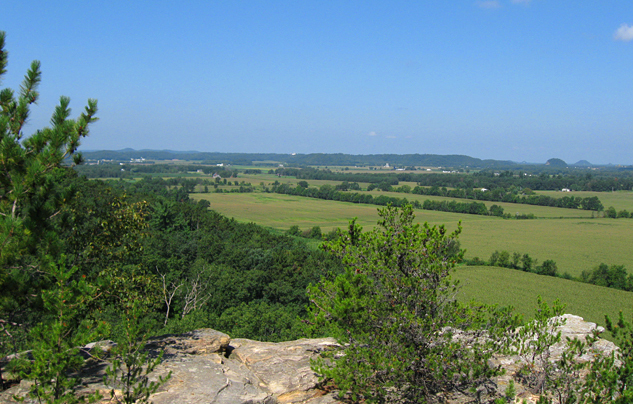 While most other land was leveled flat by glaciers, this part of Wisconsin retained all of the hills, bluffs, and rock formations from eons ago. After a morning of traveling through the past it was time for lunch. At Camp Douglas just off of Interstate 90 we came to the Home Front Café and Travel Center, where we met my sister Bev and her husband George. As the name implies, at Home Front Café and Travel Center you can fill up your car’s tank while filling yours too. During deer season you can also check in the deer you’ve bagged. The Special of the Day at the Home Front Café was meatloaf, which our waitress told us her mom, the chef, had made that morning. Dad, Mom, and I ordered the meatloaf, while Bev ordered a hamburger and fries, and George ordered the open-faced roast beef dinner. I didn’t think to ask how the Home Front got its name but Camp Douglas is home to Volk Field Air Base, built during WWII. It’s now home to the Wisconsin Air National Guard. The Home Front Café is pure Americana, with booths and tables, or a counter you can sit at. Before long our waitress brought out three plates piled high with about a pound each of meatloaf and potatoes, smothered in gravy, along with green beans and bread and lots of butter (this is Wisconsin, so butter comes with everything) all for $5.99. Bev and George also had huge servings and we all thought the meal was excellent. Now, those Michelin Guide reviewers may not make it to the Home Front Café either, but for meat-and-potatoes comfort food that I grew up on, like my Mom would make, the Home Front is the place to go. After our hearty meal (I have to admit I couldn’t finish mine) we decided to drive around the countryside. 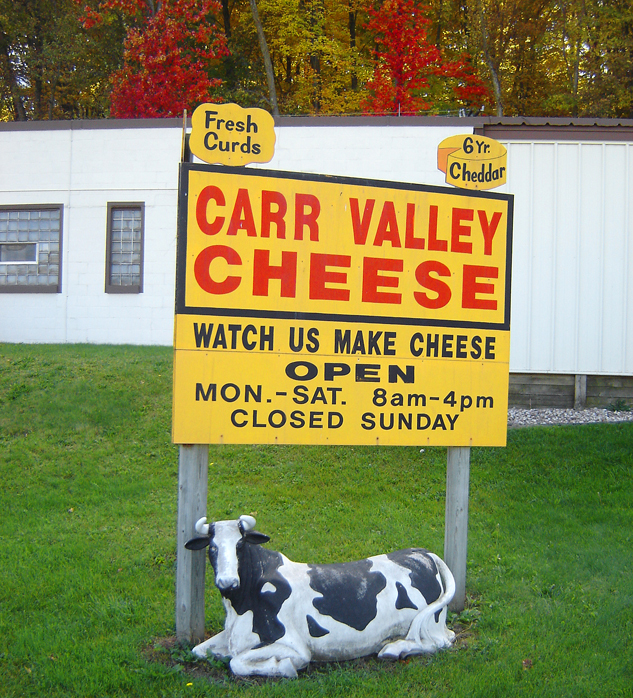 We ended up at the Carr Valley Cheese Factory and Store just outside of La Valle for some cheese curds—a reminder of the old days for us. If you don’t know what a cheese curd is, you have been deprived of one of the great pleasures of life. Cheese curds are the finished product of making cheese before it is pressed into blocks or wheels that you buy at the store. A curd is moist and slightly salty with a very mild flavor because it hasn’t been aged at all. When you eat a curd it squeaks while you chew it. My grandfather wouldn’t eat curds after they were a couple of days old because they wouldn’t squeak anymore. At Carr Valley they have a large variety of cheeses to buy, and you can watch as they make it, through windows that look into the factory. When I was growing up here, there were cheese factories all over, but now Carr Valley is the last one. Safely stocked up on curds we motored back to Reedsburg and Aunt Marcella’s and Uncle Dave’s home for one more home-cooked meal. Gary Katuin lives in Lake Helen, Florida with his wife Sharon and daughter Megan, where he owns and operates RPM Pest Management. Gary also has a penchant for collecting, wrenching-on, and driving classic Italian sports cars, and he is the third member and Crew Chief of the Cool Parts Racing #98 Miata Team. Wisconsin has small towns with their own quaintness. They are great to visit and explore. This article touches on a small part of this.